An evaporating dish or watch glass is a piece of laboratory glassware used for the evaporation of solutions and supernatant liquids,[note 1] and sometimes to their melting point. Evaporating dishes are used to evaporate excess solvents – most commonly water – to produce a concentrated solution or a solid precipitate of the dissolved substance. Most are made of porcelain or borosilicate glass. Shallow glass evaporating dishes are commonly termed "watch glasses", since they resemble the front window of a pocket watch. [note 2] Some used for high-temperature work are of refractory metals, usually of platinum, owing to its non-reactive behaviour and low risk of contamination. The capacity of evaporators is usually small – in the range 3–10 ml. 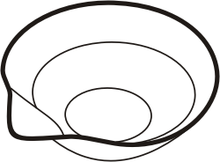 Larger dishes, up to 100 ml, are different in shape, and are more hemispherical. The shell is relatively flat. A relatively large liquid surface promotes evaporation. If heated in a flask or beaker, a part of the evaporated liquid condenses on the vessel walls and flows back into the solution. This does not happen in a dish. When heating liquid in an evaporating dish, the low walls encourage splashes and so stirring or swirling of evaporating liquids is considered bad practice, owing to the risk of spillage. Evaporation, especially in production quantities rather than merely for analysis, is now mostly performed in a rotary evaporator. This is preferred because it works much faster and may be used under vacuum, avoiding unwanted reactions with the atmosphere and allowing control of noxious fumes. Evaporation under vacuum also reduces the severity of bumping and violent ebullition. ^ A supernatant liquid is a fluid containing a saturated solution of a dissolved compound, overlying a forming precipitate of this compound. This page was last edited on 1 September 2018, at 12:57 (UTC).